Leesa Mattress Reviews - Best Online Foam Mattress? Leesa Mattress is an online, direct-to-consumer company that sells quality, reasonably priced foam mattresses that provide the comfort and support you need. Bottom Layer: 6" Dense Core Support Foam – Claimed to offer strength, durability, and support without making the top portion too firm. Middle Layer: 2" Contouring Middle Foam – Provides body contouring and pressure relief, without the risk of overheating you. Top Layer: 2" Cooling Avena Foam – Provides air flow and bounce. Claimed to offer better support than memory foam alone, in addition to inherent fire retardation and hypoallergenic materials. Cover – Made of polyester-lycra blend fabric, its soft coolness is claimed to maximize your comfort. In addition to their single mattress design, Leesa claims to make the buying process simple and hassle-free (no more feeling uncomfortable while a salesman hovers over you), and to make the installation process as easy as possible. Simply unbox your Leesa, position it where you need, remove the inner plastic wrap, and your mattress will expand and take shape over the course of a few hours. First and foremost, it’s important to note that you have several choices when it comes to purchasing mattresses online, including Casper, Tuft and Needle, Yogabed, Saatva, and more. In addition to being offered online, these companies also share other key characteristics, such as only one model of mattress, firmness levels (moderately firm), comparable prices, shipped in small, compressed boxes, 10-year warranties, and 100-night trials. » For Further Reading: Do Online Mattress Companies Deliver Better Value? According to the company, Avena foam accomplishes this by self-adjusting to your body’s contours throughout the night, which allows you to sink into the mattress at just the right level, and still allowing you free movement while you sleep. Are Leesa’s Mattresses CertiPUR-US Certified? What Does this Mean? CertiPUR-US is a not-for-profit organization that ensures the foam used in bedding and upholstered furniture is free of ozone depleters, PBDE flame retardants, formaldehyde, mercury, lead, and other heavy metals, and more. And while this is certainly positive, most other online mattress companies also offer products free of these chemicals, although not all are CertiPUR-US certified. Why Does Leesa Only Offer One Firmness Level? According to Leesa, their mattresses fall into the medium-firm category, which is what the majority of sleepers prefer. And by manufacturing just one mattress that most people will enjoy, Leesa is able to keep their manufacturing prices as low as possible, and then pass these savings along to consumers. Ultimately, this means Leesa can offer high-quality mattresses at ultra-competitive prices. Sleepopolis noted that Leesa mattresses are similar to something that you’d find at a nice hotel, and mentioned that it was nice to see the company putting such an emphasis on including a high-quality cover. Overall, they rated their Leesa Mattress a 5 or 6 out of 10 on the firmness scale, which provided 1” to 1.5” of sinkage when laying down, although the memory foam will contour to your body over the course of 30 seconds or so. In addition, their Leesa offered 3-4” of sinkage when standing directly in the middle, with very little motion transfer. The author also noted that if you don’t immediately like your Leesa Mattress, be sure to give your body 3-4 weeks to transition and become accustomed to it (we’ll talk more about this in the Pricing section). You’re a stomach-sleeper who weighs 300lbs or more. You prefer ultra-firm or ultra-soft mattresses. You’re looking for a bargain basement mattress. Finally, after sleeping on the Leesa for 3 weeks, SlumberSage claimed it offers a great balance of comfort and support, and like many of the others, they enjoyed its unique ability to provide both body contouring and a nice, springy rebound. Overall, they claimed Leesa offers the same level of quality typically provided only by mattresses that cost 3X the price. From a company perspective, Leesa mattresses are manufactured by Leesa Sleep, LLC based out of Virginia Beach, VA, although the company is not listed with the Better Business Bureau. However, there were 366 customer reviews on the Leesa website (as of 4/21/15), with an average rating of 4.4 stars. There, some of the most common compliments cited better sleep and reduced aches and pains. In fact, more than one reviewer claimed the Leesa was the most comfortable mattress they ever slept on. On the other hand, some of the most common complaints appeared to revolve around Leesa Mattress’s uncomfortableness (e.g. too soft or too firm), tendency to retain heat, and failure to provide better sleep or pain reduction. Note: Before placing your Leesa order, be sure to search online for coupons that can help save you $50 to $60 off the purchase price. Unlike some of the other online mattress companies we’ve reviewed, Leesa doesn’t sell accessories such as mattress protectors or sheets, although they do provide several third-party recommendations in their FAQ. All Leesa mattresses come with a 100-night, risk-free trial. This means if you’re not satisfied within that time, simply contact the company and they’ll come pick up your mattress at no charge. Then, Leesa will either donate your mattress to a local charity or send it to a recycling center. In fact, for every 10 mattresses Leesa sells, one is given to a homeless shelter. However, keep in mind that you must try your Leesa mattress for at least 30 days before being eligible for a return. According to the company, this will provide your body ample time to become accustomed to the new mattress and to help you really discern whether or not it’s right for you. Leesa mattresses come with a 10-year warranty against, less S&H charges. In order to cancel your trial or file a warranty claim, you’ll need to contact customer service at 844-33-LEESA (53372). Buying a new mattress is a very personal experience, so what you might find comfortable, someone else might find to be some kind of cruel torture device. However, Leesa does offer a 100-nigh in-home trial for their mattresses, which should give you plenty of time to figure out if it’s right for you. And if it’s not, you won’t be out a single penny. With all of this said, you have several very similar options from other online mattress companies, most of which have similar positive online reputations as Leesa, so be sure to check around before placing your order. I'm a back sleeper, so I like a semi-firm mattress. We've had ours for over a year now, and we like it. It was easy to unpack from the box it arrived in, and while there was an initial odor, I don't recall it lasting that long or being too bad. We slept on it on the first night and didn't have any issues. The only reason this is four stars and not five is that my side of the bed, after more than a year of ownership, seems to sink and deform faster than my wife's side, which seems to be a durability indicator, or maybe it's just customizing itself to my body. Who knows. I'm very happy with this purchase. I do not notice any fumes or strange smells, other than the plastic that it was wrapped in. Yet, as the mattress acclimated, there was no longer any smell at all. It is a medium to firm, and I find that it's perfectly suited for both myself and my 240-pound husband. We love it and even purchased one for the guest room. I'm writing this now as I cannot sleep on my mattress. This mattress is about as soft as sleeping on the concrete floor. I am actually having a difficult time breathing from the fumes coming from the mattress. This is the worst purchase I have ever made. I feel like such a fool. Do not buy this mattress. 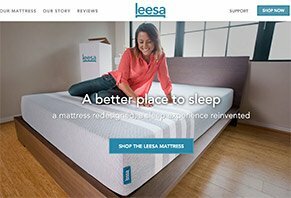 Write a Review for Leesa Mattress!